Afghanistan, Algeria, American Samoa, Angola, Aruba, Australia, Austria, Barbados, Bulgaria, Canada, China, Christmas Island, Cocos (Keeling) Islands, Congo (Republic of the Congo), Cuba, Denmark, France, French Guiana, French Polynesia, French Southern Territories, Germany, Guadeloupe, Guam, Guyana, Hong Kong, Hungary, Iran, Iraq, Israel, Italy, Korea North, Lao People's Democratic Republic, Libya, Marshall Islands, Martinique, Mayotte, Micronesia, Myanmar, New Caledonia, Norfolk Island, Northern Mariana Islands, Palestinian Territories, Papua New Guinea, Portugal, Puerto Rico, Republic of South Sudan, Reunion, Romania, Saint Barthelemy, Saint Martin, Saint Pierre and Miquelon, Singapore, South Africa, Spain, Sudan, Syria, Tanzania, Timor-Leste (Democratic Republic of), Turkey, Turkmenistan, Uganda, United States, United States Minor Outlying Islands, Vatican City State (Holy See), Virgin Islands (US), Wallis And Futuna Islands, Yemen. 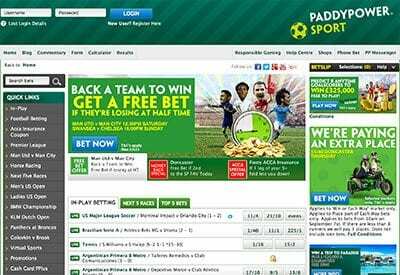 Paddy Power is one of the world’s most recognisable online bookmakers and has been an English mainstay in the gambling realm for close to 30 years. While the Irish formed company has a myriad of offline venues across the United Kingdom, they do their best work online. Paddy Power is an absolute beast in the online sports betting world, offering clients a wide range of sports and all the racing customers could possibly want. They may be a huge name in the industry but is their reputation justified? We took an in-depth look at Paddy Power so you can make an informed decision before you dive in. Paddy Power is not available for customers in Australia and America. The first thing that punters will notice when they hit Paddy Power is the abundance of their trademark green. At the top of the screen across a black section punters will find the local time of their area, as well as all the different services that Paddy Power offers such as sports, live casino, games, lotteries and bingo. In the middle of the screen you will find all the promotions that Paddy Power is currently running, which range from enhanced odds on certain sporting events to money back specials on horse races. Just below that punters have a three tab dropdown section which allows them to swap between live events, the next five races and the next five sporting events. On the left of the site customers can find quick links to the most popular sections of the site on any given day. While the Premier League season is going the site is very football centric, offering quick links to the EPL matches, as well as international games and promotions pertaining to all things football. Just below that is the A-Z sports listing section, which has easy-to-follow links on all the events Paddy Power allows you to bet on. One of the most intriguing and unique aspects of the Paddy Power product is their virtual sports section. Punters who are finding it difficult to identify a market that are keen to wager on can head over to the virtual sports section and invest on a plethora of different “sports”. These events run 24 hours a day and offer something different for those who want something different from their online punting experience. Some companies like to offer occasional promotions to encourage punters to use them, but few come close to the offers that Paddy Power throw to their customers. As well as offering daily money back specials on horse racing, enhanced odds on sports from around the globe and cash back deals on a number of events, Paddy Power also offer punters who do not yet have an account with them a huge incentive to sign up a fresh account. 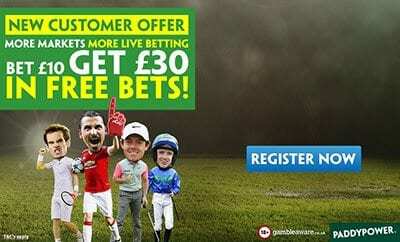 Punters can get a free bonus up to the value of £250 when they sign up an account at Paddy Power. A company as big as Paddy power does not mess around when it comes to assisting customers in depositing cash. One unique method of deposit for Paddy Power is the cash deposit option, which is available due to the fact they have offline businesses. Paddy Power utilise all the traditional withdrawal methods such as credit card and bank transfers, but again the company’s main strength is being able to have punters go in store to get their cash directly from a shop. Given the might of the Paddy Power machine, it is naturally assumed they will have adequate customer service for their users, but Paddy Power go above and beyond for their clients. Not only do they offer 24 phone customer service, but they also offer live-chat facilities for those who do not have access to a phone. Something that is completely unique to Paddy Power an average response guide, which gives details to clients on how long they can expect to wait on the method of contact they will use. Paddy Power is one of the biggest names in the online sports betting world and their definitely justify that tag. Their website is easy to navigate, events are simple to find and their virtual sports section is terrific and unique. The only problem we see with Paddy Power is the inability of users in America and Australia to sign up for an account. This is not an issue for those who geographically can sign up at Paddy Power, however, and those punters who are looking for a new bookmaker will find their Paddy Power experience is up there with the very best in the online sports betting realm.